9:00 AM – Brian and I slept in! It was a great way to start our last day as just a married couple. We relaxed in bed for way too long – reading, playing on our phones, just enjoying the freedom of not having anything to do. When we eventually got up, showered and dressed, we watched Jeopardy and did some last minute cleaning. Brian even baked two loaves of banana bread while I impatiently bounced on the exercise ball. We were going to go to a movie, but after several Facebook comments, we decided to forego the movie and instead took a nice long nap. After our nap, we went into town. Before heading to the hospital for the induction, we stopped and got haircuts, then went to Texas Roadhouse for a delicious dinner! We even had time to stop at Caribou Coffee for some drinks! 6:30 PM – We arrived at the hospital. Since we had already completed our pre-registration, we headed right to the birthing center and got the induction started! They had to start an IV. I was so apprehensive about it. And I had a good reason to be! The nurse was struggling to find a good vein and had to try in BOTH hands before getting it – and when she did get it, it HURT like crazy. I kind of wanted to throw up. I was really disappointed that I had to be hooked up to the monitors after they placed the pill. I was noticing that the contractions were starting to pick up in intensity and frequency. My parents and sister stopped by to visit and see how things were going. At this point, we knew nothing would happen until the next day, but it was nice to have company to keep us occupied. Brian and I spent the next hour or so watching the Olympics until we decided we were tired enough to try to sleep for a while. 1:30 AM – I woke up with the most intense contractions so far in the labor process. (Looking back, they were NOTHING!) It was about that time the nurse came in to check me – I wasn’t too dilated or effaced, so she inserted another pill. She told me I should probably try to eat some toast. I willingly ate my pregnancy staple breakfast: peanut butter toast. Brian was snoozing away as I ate and worked through what I thought were “painful” contractions. 6:00 AM – The nurses checked me again, I’d dilated to about 3 or 4. Brian woke up and we walked around a bit and Brian had some coffee. My mom and sister came in and we chatted for a bit. It was an early morning… I never thought the day would last another 15 hours! 8:00 AM – Dr. Kenna came in and broke my waters. I was about 4-5 centimeters by this point. Once my waters were broken, things escalated very, very quickly. 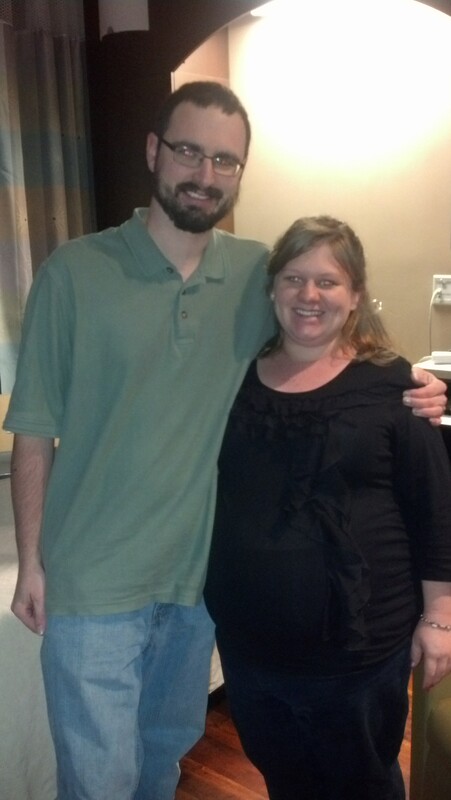 Luckily, my birthing coach, best friend, and father of my baby, Brian was right by my side. He was a super star helping me to breathe through increasingly longer and harder contractions. 9:00 AM – I decided it was time to try relaxing in the whirlpool for a while. The contractions were low and hard and I was really struggling to calm down. The tub helped for a little while, giving me a rest while Brian chatted with his parents and sisters who came for the big event. I had a student nurse in with me during the day, and she was an amazing help during this time. She, Brian, and my mom kept reassuring me that I could do this. It was great to have the encouragement. 10:30 AM – I caved. I kept saying “I don’t have to be a superhero, I don’t have to be a superhero.” I knew I was already getting tired. Our original plan had been to wait to get the epidural until I was completely dilated and effaced. But, after talking with Brian and my nurses, we decided that it was time. I think I could have held out longer, but they wouldn’t let me walk or bounce on the ball because they needed to keep the baby hooked up to the monitors, and as she was throughout the whole pregnancy… she wasn’t cooperating unless I was laying down. So, the nurses called the anesthesiologist and we got the party started. Okay, this is where the timeline gets really, really fuzzy for me… so no times until we get to the big event! They had a student anesthesiologist insert the epidural. It took her several tries, and finally the doctor went ahead and did it. As soon as they got it placed, I started feeling really weird. Next thing I know, I’m on oxygen, lying flat, and they’re pumping me full of something through my iv, and making comments about how the baby was doing. Apparently, the epidural went ‘up’ and was causing problems. We eventually got it all straightened out without any problems with baby. At one point, during my half sleep phases, I awoke frantically because I was certain I had started singing “Dreidel, Dreidel, Dreidel.” They laughed and assured me I hadn’t sung it out loud, but I know for a fact it was on a loop in my head for some unknown reason. While I was finally able to relax and rest, little baby girl was starting to struggle. She was showing decels AFTER contractions – not during contractions, which was causing concern for the nurses, Dr. Kenna, and the anesthesiologist (who kept checking in on me during the afternoon). Added to the fact that I was stuck between 8 and 9 cm, Dr. Kenna had the discussion with us that we should maybe think about the possibility of a c-section. This is where I lost it. I completely broke down. I felt like if I had a cesarean, I would be a failure. I was a mess. I expressed my concerns about c-section: being a failure, difficult recovery, recurrent c-sections with future pregnancies. So Dr. Kenna said she would give me 30 minutes to labor on my own, then we’d re-evaluate. Now, at some point, the epidural had started to wear off, and the anesthesiologist had adjusted the levels, but it was just not sticking anymore. So, in addition to the pitocin contractions, and the lack of epidural, I was laboring completely on my own. It was seriously, the most intense sensations I had ever felt. Painful doesn’t even begin to describe it – it was just intense. I made everyone except Brian and my mom leave the room. With one of them on each side of me, I found my center and worked through the contractions – lots of breathing, lots of ice, lots of cool rags. I completely blocked out everything else and just worked on letting my body try to get where it needed to be. Until I just couldn’t anymore. I was exhausted… tired in a way I will never feel again… All of my fears about c-section were gone. When Dr. Kenna told me that I wasn’t fully effaced yet, and that she didn’t really think I would be able to get there without putting the baby under too much stress, I agreed. I agreed that c-section was the best option. They gave Brian scrubs, and prepared me for surgery. It took a lot longer to get me into surgery than I thought it would. Eventually, they wheeled me back to surgery – through a hallway of all my supporters and the people who love me, Brian, and this little baby more than anything. The nurses had Brian wait in the wings while they inserted the spinal block. The anesthesiologist got right to work, and next thing I know, they’re laying me down and I’m already feeling the spinal block take effect. Then I make a comment that it’s starting to get difficult to breath. Yep, it’s really hard to breath. I … can’t… breath. And things went dark. Brian said that a nurse came out and didn’t tell him very much but said that he could wait in the waiting room. A lot of confusion followed for him until someone came out and told him that his daughter had been born. 9:15 PM – A precious little 7 lb, 3 oz, 21” baby entered this world. 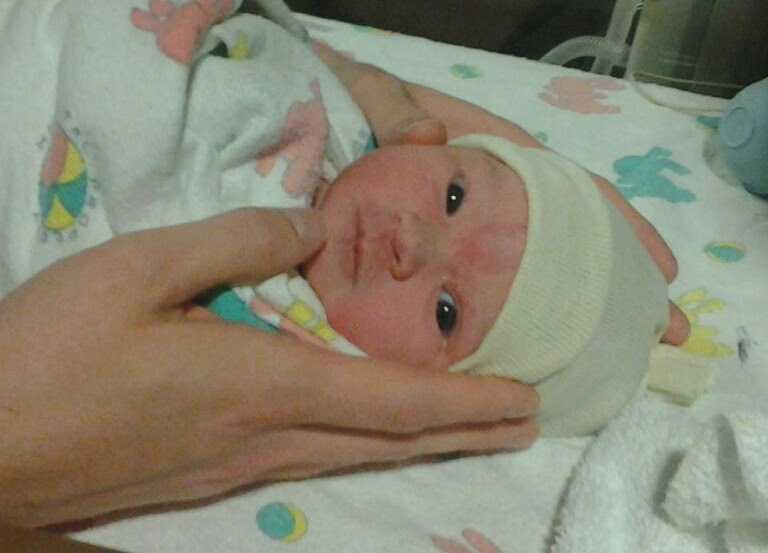 She was face up when Dr. Kenna pulled her out of my womb, smiling with her bright eyes, ready to face the world. She also had a knot in her cord – something my doctor hadn’t seen often. Some of her stats were low, so they put her on oxygen for a bit. They took her back to our room and Brian got to meet his daughter. He was able to feed her a bottle, and hold her. He was very protective of her and wouldn’t let anyone else hold her until I had gotten to see her. I woke up in the recovery room, with my mom, doctor, and favorite nurse surrounding me and taking care of me. I asked each of them if I was really alive, and they all laughingly assured me that I was. And that I was the mother to a sweet baby girl. As soon as the crazy shivering stopped, they took me back to my room, and there she was… this precious little girl in her daddy’s arms. I was able to hold her and coo over her. While the nurses, Tiffany, and my mom were all taking pictures and talking, I whispered into her ear that I knew this baby’s name. Brian agreed that it was perfect. We held off telling anyone until the next morning when everyone could be there. Before the family came in, I realized I had a headache that just wasn’t going away. Sure enough, after several hours, we had determined that I had a dreaded low pressure headache. I had one last February when I had my lumbar puncture done, so I knew how nasty they were. During the insertion of the epidural or the spinal block – or both, the little space where all the spinal fluid is was punctured. This led to a spinal fluid lead, which results in a headache that is eased by lying completely flat, but feels like death when elevated even a little bit. I tried to tough it out for a while, but knew that the only solution was an epidural blood patch. That’s where they draw a bunch of blood, and inject into the epidural space. When it works, you feel IMMEDIATE relief! I did, and was able to go about the rest of my Thursday enjoying my sweet precious little girl. She was passed around and loved on, she nursed like a champ, and I was able to slowly start to heal. While I wasn’t able to get around too well, I did take a few laps around the birthing center. Daddy was a superhero the first few days of Adelaide’s life – he changed pretty much all of her diapers and was diligent about bringing her to me when we needed to nurse. We celebrated Adelaide’s first Valentine’s Day still at the hospital. Brian went out and got red velvet cupcakes! My mom, dad, and sister came to the hospital to share in a little party! We had so much to celebrate, after all: My mom’s birthday (which is ALSO on February 12th! ), Adelaide’s arrival, Valentine’s Day, and my parent’s anniversary (which is on the 16th). When it was time for them to leave, I noticed that I was starting to get a headache. Because of my intracranial hypertension, we weren’t surprised that all of the events of the previous day were causing a headache. I rested as much as I could. The nurse’s even came in during the night and took Miss Adelaide for a walk and got her to sleep so that Brian and I could have a little break to just sleep. After the blood patch, we received our discharge papers and started gathering our things to go home! That evening, my parents picked us up and took us to our house and made us a lovely dinner. After some more snuggling on lovely Adelaide, they left us to try this whole parenting thing on our own. That night went pretty smoothly, as have the last 8 weeks. We’ve had our rough spots, but overall, we feel like we have the hang of this parenting thing … at least for now!